Risers! Today’s the last day of the June sit up challenge! 100 a day, Monday through Friday, for four weeks. That’s 2000 sit ups total! How did it feel? Did you stick to the challenge? Did you come close? Or did you crunch out of bed in the morning and leave it at one rep? Regardless of how you fared, let us know about your experience! This month we’re going to do something a little bit different. We’re going to be tackling some miles. Not running – we already had our running challenge back in February. This time we’ll be walking with the weight of the world on our shoulders. Okay, maybe just 10-45 pounds. For the month of July, we’re rucking. No, not this kind of rucking. We’re taking after The Rise ATX crew, as they’ve incorporated rucking into their weekly regimen. Keep in mind they start at 5:12 AM! July 3rd: Meet at the Brooklyn Bridge, Manhattan side. Walk across the bridge to Brooklyn and come back via the Manhattan Bridge. July 24th: Meet at the Williamsburg Bridge. Walk to the East River Path, then around the southern tip of Manhattan to the west side and end at 14th Street. Remember, these are 3, 4, 5, and 6 miles, respectively. Bring water and snacks with you. Especially water. Assume we will not stop rucking until we reach our destination. We may include a bonus shorter T.RUCK with some stops along the way on the 31st. Stay tuned for deets! You can buy bricks from Home Depot or Lowe’s. You’ll want to wrap them up together with duct tape (to keep the weight all in one place and to also prevent the bricks from scratching up the inside of your bag). You can find a guide to wrapping bricks here. You can buy a fancy schmancy $200 GORUCK sack if you’d like, but no need. Any backpack will do. But I’d definitely avoid using one of these drawstring bags. Position the weight near the top of your backpack. This will keep the strain off your lower back. You can use a yoga block to prop up the bricks and keep them near the top of your bag. Bring water. Bring water. Bring water. It’s July. It’s hot and humid most of the time. Be smart. As for snacks, you can bring energy bars, gels, etc. Something easy to consume on the go. Find some weight, load up your bag, and practice walking this weekend for a mile or two. Can’t wait to see you all Tuesday night for our first 3 mile ruck! 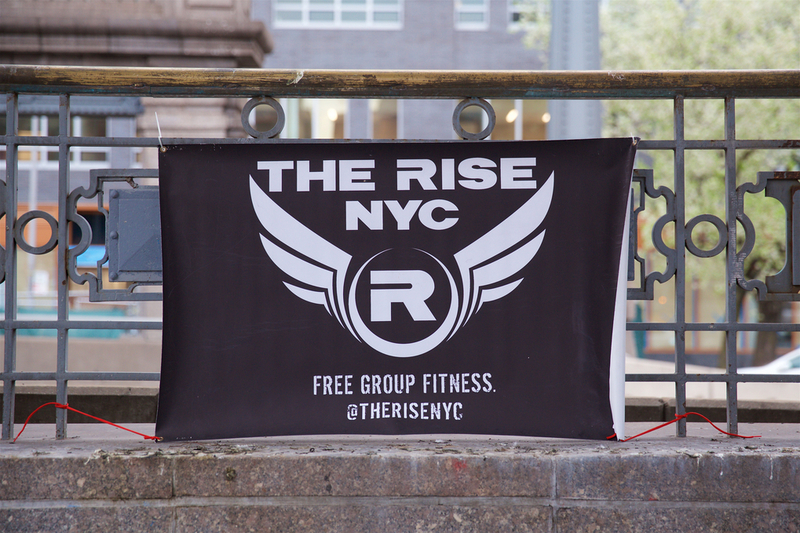 PS – we may be rucking at night, but we’re still an early morning fitness group! All our workouts are here. Start your mornings the right way. The Risey way.